YT081 – What Are The Chords On The Bass Guitar? Click Here To Download The FREE Essential Guide To Bass Guitar Chords PDF! 98% of the time the bass doesn’t NOT play chords*. 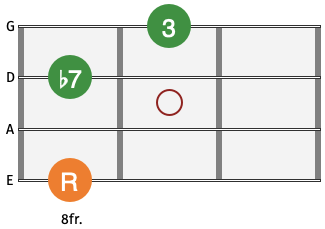 But chords are very important for a bass players to understand… and we can use them the other 2% of the time. The reason the bass doesn’t play chords 98% of the time is because as soon as the bass player more than one notes down the bottom end of the neck the sound on the whole becomes muddy and indistinct. On the whole it isn’t a pleasing sound to the ear especially within the context of rock, pop, soul, Motown and funk music. But I understand this question. Guitarists and keyboard players are always discussing what the chords to particular songs are… so why shouldn’t this apply to the bass guitar? 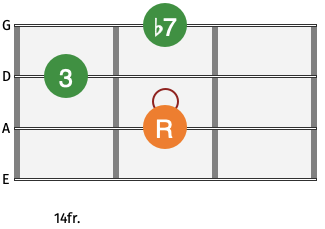 You may have heard of or used ‘Arpeggios, Chord Tones and Triads’ as part of your bass lines. The definition of an arpeggio is a ‘Broken Chord’. So if your guitarist say ‘we’re playing the chord of C Major’... a C Major arpeggio is a great place to start creating your bass line. ​Chords are super important to understand because they provide the harmonic foundation of all music. So there’s no reason why we can not learn them on the bass guitar and use them as a ‘study tool’. I will often learn to play to chords to a song on the bass guitar because I know it’ll improve my understanding of the song… which will in-turn allow me to create better and stronger bass lines. 2 - The other 2% of the time! A well placed chord on the bass guitar can sound absolutely fantastic… no questions asked. But, on the whole, chords need to be used sparingly. Personally a will slip in the occasion cheeky chord here and there. More often that not this will be right at the end of a song. 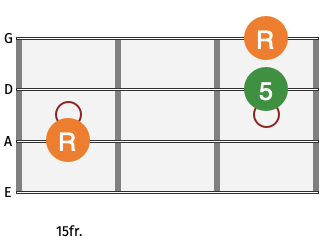 Where is the best place on the fingerboard to play chords? As we touched on earlier chords on the bass guitar can sound muddy or indistinct especially when played lower down on the neck. 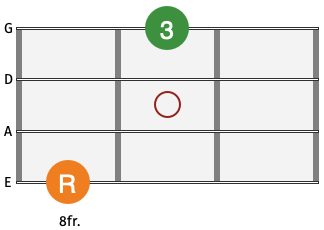 So the best place to play a chord on a 4 string bass is more often than not above the 7th fret. 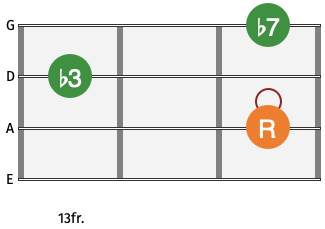 For more complicated Jazz or Funk chords they tend to sound best above the 12th fret. I’ve said many times before music is an art and science and these are just guides to get you thinking in the right direction. When can you play chords extensively on the bass guitar? There are absolutely times what chords can be play more extensively on the bass guitar. One the whole you’ll find bass guitar chords featured in more progressive styles of music such as jazz and fusion music. On the whole chords on the bass guitar work best when the other ‘chordal instruments’ stop playing. If the bass plays chords it often encroaches on the frequencies of the keyboards or guitar. If they don’t stop playing you will either loose the bass guitar chords in the mix or band will start to sound muddy. The other option is loose the harmony instruments altogether and let the bass guitar do the work. Colin Hodgkinson dis this masterfully with the British band ‘Back Door’. In this situation Back Door this works well because there is so much musical ‘space’ between the saxophone and bass guitar… which allows them explore many more possibilities. 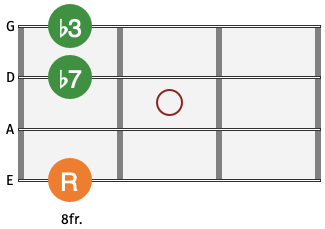 This is the first place I would recommend anyone wishing to experiment with chords should start. This are simple two note major or minor chords which work we in the majority of pop and rock music. The sound good because there is a large gap between the lowest note and the highest note. 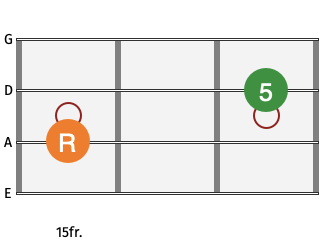 These are chords which use on of the open string. 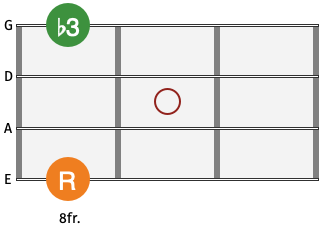 On a 4 string bass there are only 3 options to do this using the E, A and D string as the lower note. There are many options to use for the higher notes. Here are the first 3 you can start experimenting with. Closed Voicing are rooted on the A string. They use 3 notes on 3 consecutive strings which is why they are called closed voicing. Typically they are constructed with the root on the A string, 3rd on the D string and 7th on the G string. For me these are prime example of chord which comes to life in the upper register of a 4 string bass. If you’re interested in discovering more about chords on the bass guitar make sure you download our FREE The Essential Guide To Bass Guitar Chords for an overview of all the chords you should be familiar with on the Bass Guitar. 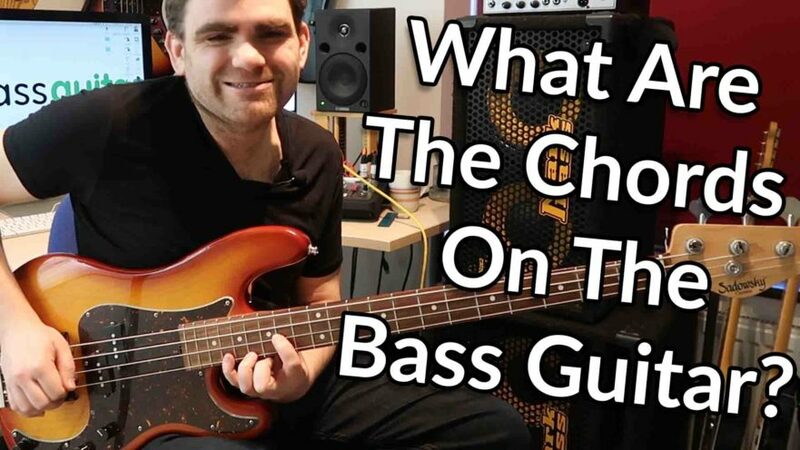 Click Here To Download The FREE What Are The Chords On The Bass Guitar PDF!